RecurDyn is an interdisciplinary, computer-aided engineering (CAE) software package whose primary function is the simulation of MultiBody Dynamics (MBD). RecurDyn simulates both rigid and flexible body dynamics by combining traditional rigid MBD with cutting-edge finite element technology for modeling flexible bodies. In addition, RecurDyn also includes a tightly-integrated controller design tool, design optimization, particle dynamics for granular materials, and durability and fatigue analysis. RecurDyn also supports co-simulation with various other computer-aided engineering software tools. RecurDyn includes a seamless co-simulation environment for coupled simulations with computational fluid dynamics solver, Particleworks from Promotech, allowing for detailed analysis of the interaction of fluids and multibody systems. The base component of RecurDyn is RecurDyn Professional. RecurDyn Professional provides the capacity for all pre- and post-processing, simulating, and and analyzing rigid body systems. It also includes a complete customization environment. RecurDyn Professional is required to use any additional toolkits. Toolkits add functionality to RecurDyn Professional, including GUI features and solver code specific to the field of the toolkit. RecurDyn Professional includes RecurDyn Modeler, the pre- and post-processing environment, RecurDyn/Solver, and RecurDyn ProcessNet, the customization environment. RecurDyn Professional provides rigid body analysis. It includes a library of algebraic, idealized constraints and a library of rigid-to-rigid body contact algorithms. RecurDyn Professional can perform various kinds of analyses: Dynamics Statics Position, Velocity, and Acceleration at the initial time Design Studies and Design of Experiments. RecurDyn Modeler is RecurDyn’s powerful, yet simple and intuitive GUI. It is a complete pre- and post-processing environment for rigid Multi-Body Dynamics (MBD). It provides the ability to create models, set up all model parameters and data, and initiate and control the solver, display simulation output in both plots and through animations, and create and manipulate output data files. 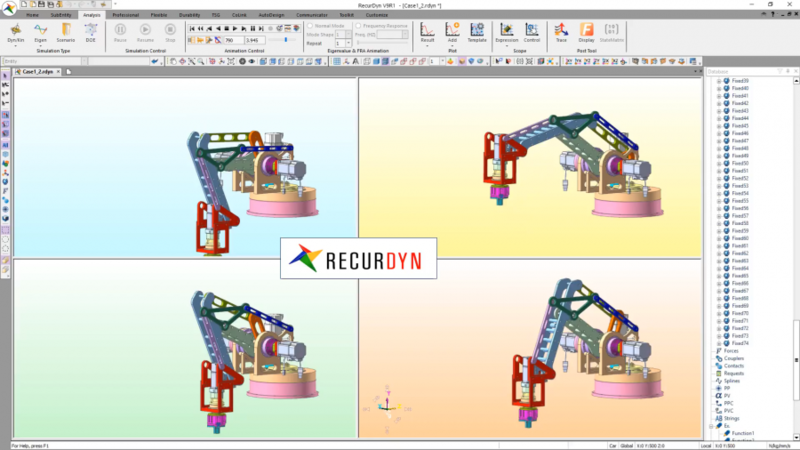 RecurDyn Modeler allows for models to be created graphically with simple mouse and keyboard commands to rapidly position bodies, define joints, force elements, contact, and other elements visually and intuitively. RecurDyn Modeler can be extended for many purposes including flexible bodies, media transport systems such as printers and roll-to-roll media handlers, tracked vehicles, and others through various additional toolkits. RecurDyn Solver is the class-leading solver for Multi-Body Dynamics. RecurDyn Solver is based on advanced computational and numerical technologies, making it incredibly fast, stable, and robust, even for systems that contain very complex contact conditions. RecurDyn Solver included with RecurDyn Professional simulates rigid body systems. It can be extended to provide additional capacities through toolkits. For example, RecurDyn can be extended to simulate flexible bodies, media transport systems such as printers, elasto-hydrodynamic bushings, and mechatronics control systems through toolkits. RecurDyn Solver combines these systems into a coupled system of equations that are solved simultaneously rather than through co-simulation, which makes RecurDyn Solver faster and much more robust. RecurDyn/Solver for rigid body systems provides the implicit Generalized-Alpha method and DASSL for numerical integration of differential equations. RecurDyn/Solver can perform both static analysis as well as dynamic analysis. RecurDyn ProcessNet is a powerful, script-based customization environment that is built into RecurDyn Professional. RecurDyn ProcessNet allows users to create their own GUI features for RecurDyn Modeler that can manipulate model data, create customized dialog boxes and UI features, automate tasks, and encapsulate domain knowledge and best practices. RecurDyn ProcessNet can access and manipulate both pre-processing data as well as post-processing data. RecurDyn ProcessNet uses Microsoft.NET for the scripting environment. Scripts can be created using C#, Visual Basic.Through RecurDyn ProcessNet, users can dramatically extend the functionality of RecurDyn Professional to meet their unique, individual needs. RecurDyn Professional includes a library of contact elements. The contact elements are of various types. General contact elements process contact for general geometric shapes. General contact elements for both 3D cases, as well as cases in which contact can be processed in a 2D plane for increased computational efficiency. Primitive contact elements offer the ability to process contact between simpler, analytical contact shapes, such as boxes, spheres, cones, cylinders, as well as other shapes. Primitive contact elements are extremely efficient for cases in which the geometry matches these analytical shapes. Additionally, various toolkits extend the contact library, adding additional contact technology specific to these toolkits. Subsystems are collections of bodies, joints, force elements, contacts, and other elements. Subsystems can then be imported into other models and into other subsystems. Or subsystems can be simulated independently. This can simplify modeling by allowing the elements of a model grouped and reused.Subsystems are collections of bodies, joints, force elements, contacts, and other elements. Subsystems can then be imported into other models and into other subsystems. Or subsystems can be simulated independently. This can simplify modeling by allowing the elements of a model grouped and reused. RecurDyn Professional contains sensor elements that can be used inside a model for many purposes, such as to aid in analysis of the results or to provide input to mechatronic control system simulations. There are many different kinds of sensors. For example, there are sensors to measure the distance between geometric features of bodies, to indicate if a body is in a specified region of space, provide the position, velocity, or acceleration of specific points on a body. RecurDyn allows users to write simple programming expressions that are executed and evaluated during the simulation of a model. Expressions are text strings like sin(5*time) that can be used for many purposes in RecurDyn, such as to specify the position of a body that varies with time, to specify a reaction force, or to create a user-defined constraint equation. Expressions are written directly in RecurDyn Modeler, and provide a very simple but very powerful way for users to control parts of a model or generate data that can be analyzed after a simulation.